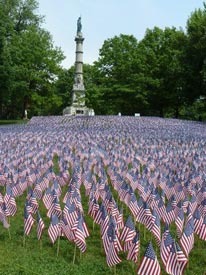 Every Memorial Day weekend, the MA Military Heroes organization plants a Garden of 37,000 Flags in front of the Soldiers and Sailors Monument on Boston Common to commemorate the Massachusetts service members who have given their lives to defend the United States and our freedom. On Thursday, May 22, the Massachusetts Military Heroes Fund, a non-profit dedicated to the families of military service personnel from Massachusetts fallen in service to the United States, will host a service at 10:30 a.m. at the Soldiers and Sailors Monument on Boston Common. died as a result of active duty post 9/11. The reading will take place among a flag garden with 37,000 miniature American flags honoring the sacrifices of all fallen Massachusetts service men and women dating back to the Revolutionary War. Flags will be in place from Thursday through sundown on Monday, May 28. This is really something to see.... a field of red, white and blue. Check it out then enjoy the rest of the Public Gardens.